Stampin' Up! has published a Holiday Gift Giving Guide to provide you with convenient gift ideas for kids, teens, neighbors, and more! Click HERE, or on the image to the left, to download your Holiday Gift Giving Guide. Through January 4, 2010, when you purchase $50 in product from the Holiday Gift Giving Guide, you'll get a BONUS GIFT of your choice of a FREE Décor Elements item up to $16.95 in value! SHOP NOW in my ONLINE STORE! 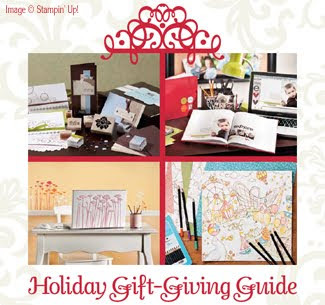 You can never get started shopping too early for the holidays, and especially purchasing supplies for handmade cards and gifts, but if you want to get the most bang for your buck, set your calendar to check out my ONLINE STORE November 23-30, to take advantage of AMAZING DISCOUNTS on select products during Stampin' Up! 's Online Extravaganza. 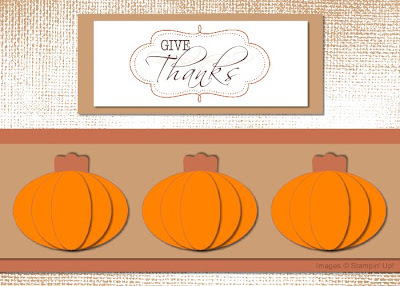 What better way to shop while enjoying your Thanksgiving holiday, than online? FREE Handmade Holidays, Party Planning, and Gift Giving Consultation! Email me or call me now at 719-205-5957 for a free private consultation on handmade holiday cards and gifts! Let me help you put your shopping list together now, so you can get started right away. 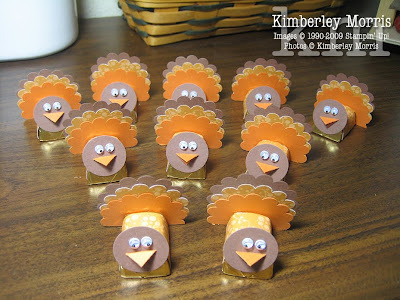 Are you having a holiday party and need some ideas for fast and fun favors? I can definitely help you there! I also have project ideas for gifts, from simple, to that one-of-a-kind keepsake for that special someone. And, I can help you put together gift packages of products that coordinate, if you are giving to someone crafty, but don't want to create a homemade gift yourself. Whatever your holiday crafting and gift giving needs, I've got them covered! 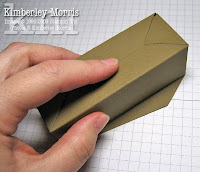 Click HERE for a pattern and simple directions for the Triangle Box and Square Box pictured above. *Rebate is calculated on retail price paid, excludes shipping & handling. Welcome to my blog entry on the October 2009 Tour de Freaks Blog Tour! This month's theme is Christmas Cards, and you should have just arrived from the blog of the talented Shona Watson. I think my personal theme for this month is "non-traditional" holiday colors. I'm really enjoying using natural colors like Soft Suede, Sahara Sand, and Kraft. My first card is full of snowflakes, but there's nothing specifically Christmas-y about it, so you can send it even if you don't celebrate that holiday. It features the Serene Snowflakes stamp set and the Four the Holidays stamp set. To make the ribbon, I layered Very Vanilla Tafetta Ribbon over the solid side of the Soft Suede Polka Dot Ribbon. This is not a complicated card, but because of all the brads used on it, I probably would only make these for my very special card recipients! 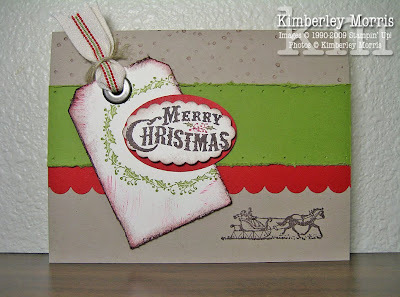 This next card is made with the O Christmas Tree Popup Bigz XL Die, which you use with the Big Shot. It's really hard to get a picture to do it justice, but these cards are just spectacular to open up in person. Because of the numerous times through the Big Shot to get all the pieces you need, and to emboss the tree pieces, and cut out all the ornament pieces you need, I don't recommend making these in large multiples. The next card was made with the Patterned Pines Hostess stamp set (available in the Holiday Mini Catalog) and the colors are Old Olive and Rich Razzleberry, with a Pale Plum layer. These colors coordinate with the Cottage Wall Designer Series Paper layer. There's a little bit of Champagne Mist Shimmer Paint around the edges of the Pale Plum layer, giving it a glittery look. This last card is one that was created by a fellow demonstrator for a Susan G. Komen fundraising event I participated in earlier this month. I stamped some of it at the event, because I don't own this Yuletide Christmas stamp set--then I brought the pieces home and tried to remember what the card looked like! 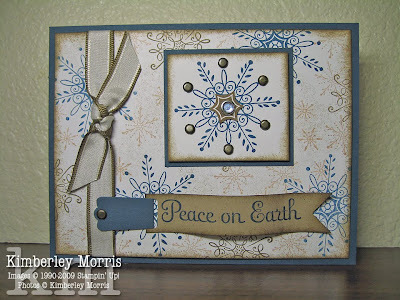 I added "snow" to the top of my card, using the Itty Bitty Backgrounds stamp set. 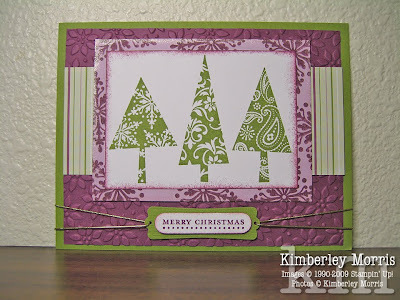 This is a great card to make in multiples, because the stamping is easy and it goes together really fast. Your next stop on the blog tour this month is Jan Tink's blog. Enjoy your Halloween, but don't forget to take notes along the blog tour so you can get a head start on your holiday cards. Before you know it, December will be here, and if you don't plan ahead, you'll find yourself too busy to enjoy the rewards of handmade holidays this year! In true procrastistamper style, I came up with this creation right before our Thanksgiving feast last year. So, there was no time to post them on my blog for them to be of any use to anyone else at that point. I'm lucky I remembered to take a picture of them. I completely forgot about these until someone asked about "turkey" project ideas. 2) Punch out three coordinating tail feather layers with the Scallop Circle Punch. 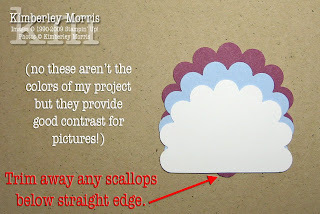 3) Trim away the bottom 5 or so scallops from one of the punched pieces (see below). 4) Line up the trimmed piece on the next layer, leaving about 4 scallops showing. 5) Adhere those 2 pieces together after they are arranged the way you like, and trim off the 4 scallops flush with the top trimmed scallop punch (see below). 7) Adhere the tail feather section to the back of the Nugget with a Mini Glue Dot. 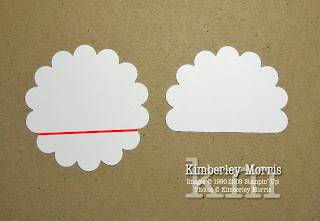 9) Cut a 1/2" square of beak-colored card stock or paper, score diagonally and fold in half. Adhere back of this folded square to the head, under the eyes. 10) Adhere head to front of Nugget with a Mini Glue Dot. 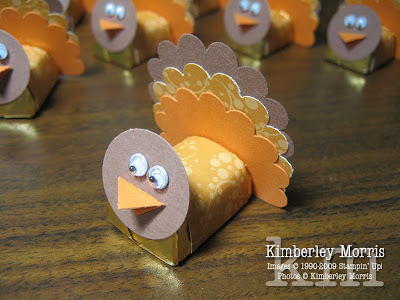 My turkeys from last year were made with retired Designer Series Paper, but the Autumn Traditions Designer Series Paper in the current catalog would be a perfect substitute. Matching colors for that package of paper include: Soft Suede, Elegant Eggplant, Ruby Red, More Mustard, and Always Artichoke. You can shop for these items anytime day or night, in my ONLINE STORE. DESIGN IDEAS: Use the Trio Flower Punch to punch out a red flower to adhere under the beak as a "gobbler". These also make darling punch embellishments for place cards or napkin rings if you omit the Nugget, and glue the head directly onto the tail feather layers, for a 2D turkey. Make a coordinating set of one Nugget turkey, and one punched turkey place card, and a turkey-embellished napkin ring of Designer Series Paper for each setting at the table. Check out the original tutorial to create these treat holders HERE. You can take these with you to hand out to the grownups handing out candy at each home when you go out door-to-door with your kids, or if you're staying home yourself, give these to the parents who are accompanying their kids, when they come to your door. The kids will thank you for keeping their parents' hands out of their trick-or-treat stash! When you order the following items, you can GET SUPPLIES FOR EIGHT TREAT HOLDERS FREE! With the products below, you'll have everything you need to make your own treat holders, except the Ghirardelli® Chocolate Squares™. For those of you who have the rest of the supplies listed in the table above, or other similar product you'd like to use, to make the Little Boo Treat Holders, I have a kit of the cut, scored, and punched card stock pieces, as well as the ribbon you'll need, available for you to order below. You must order in multiples of 8, and Ordering is only open from October 12th through 19th, so get your supplies TODAY! Supplies in multiples of 8, two each of four color varieties. KIT CONTENTS: 8 treat holders (2 ea in 4 colors), cut, scored, and punched. Also included are 8 lengths of ribbon (2 ea in 4 colors) to tie each holder closed, 8 punched Scallop Circles and 8 layer rectangles (both 2 each in 4 colors). You will also receive a strip of Whisper White card stock approximately 1-1/2"x8-1/2", onto which you may stamp your image (Little Boo) before punching out. 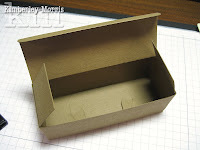 You can also download the entire list of supplies needed to make your own treat holders HERE. If you look at the full supply list carefully, you'll notice that not all of the card stock from the 12"x12" In Color Textured Card Stock package is used. 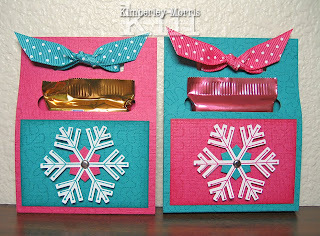 That's totally cool, because you can save those sheets to make the cute Simple Snowflake Treat Holders, shown below. Don't worry, if you don't want to buy all the supplies for those right now, I'll be offering another $50 special soon, where you can get supplies for 8 Simple Snowflake Treat Holders for FREE! My Digital Studio - 50% Off! This morning I want to share a couple of 5x7 cards I designed for a friend, who has two huge packages of 5x7 cards and envelopes sitting in her closet. I am so used to starting from a colored card base that it was challenging to figure out how to start with a white card base! 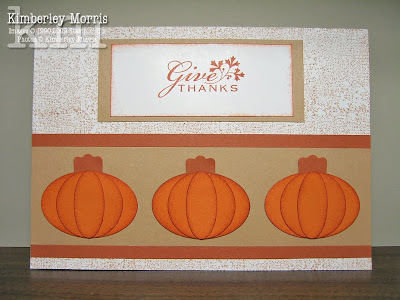 I happened to create a 5x7 card similar to the first one, using Stampin' Up! 's newly released My Digital Studio software. Since the software uses the fonts on my computer, I was able to create a flowing script greeting I don't have available in a stamp. I also used a stamp set I don't own, for a frame around the greeting, because that stamp set is included in My Digital Studio! I stamped the design first, then duplicated it digitally, but you can also use My Digital Studio to design your cards before stamping, which saves you from using your consumable supplies! My Digital Studio is a digital paper crafting solution, with exclusive Stampin' Up! images and product. You can create cards, scrapbook pages, calendars, DVD interactive slide show albums, and even professionally printed book albums using the My Digital Studio print services. 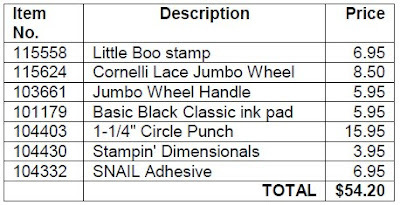 All professionally printed products color match Stampin' Up! 's exclusive colors (when you choose those colors in the program), and the embellishments are true size, so you can add elements to a printed item to make a hybrid creation with more depth and texture! You may also shop my ONLINE STORE any time, using a debit or credit card. 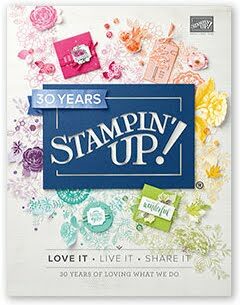 You can earn free stamp sets and merchandise, called Stampin' Rewards, when your order reaches $150. I also always send all my online customers a hand-stamped 'thank you' card, with a goodie package of items which coordinate with their order. 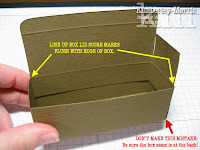 Download the PDF pattern for the box lid for FREE HERE. First, run some card stock through your Big Shot with the Box #2 die. You can use a piece of 5-1/2" x 11" card stock, so you can get away with using letter sized card stock, or you can go ahead and cut down from a 12" x 12" sheet if that's what you have. I think the Soft Suede textured card stock is great for this, and you can get 8-1/2" x 11" textured card stock in the In Color Textured Card Stock Assortment, if you don't want to buy full 12" x 12" sheets. TIMESAVER TIP: you can leave your Box #2 intact, and just assemble the box and proceed with cutting out the lid shape(s) and decorating, if you don't mind a taller coffin. I personally think the shorter version is a little more lifelike...or should I say, deathlike? After you trim the box down, you'll be left with the box piece, and the lid part (see picture below). Assemble the box part, then reattach the lid and side flaps. The easiest way to put the lid and side flaps on, is to cut the lid plus one side flap away from the rest of the lid. You adhere the lid and side flap inside the box. Then, adhere the remaining single side flap to the other side of the box. To make it fit well, you'll probably want to trim just a tad off the side flap. See the pictures below for a visual step-by-step. 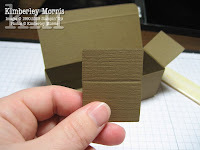 TIMESAVER TIP: If you don't want to trim pieces of Sticky Strip to assemble your boxes, consider using SNAIL. Liberally cover both surfaces to be adhered, with SNAIL, and burnish pieces together firmly from the inside of the project with your Bone Folder. That way, the adhesive sticks to the adhesive, giving a stronger bond. 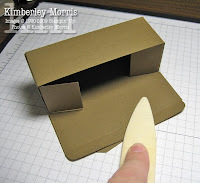 When the box is finished, set it aside and take up the coffin lid pattern sheet you downloaded from the link at the top of this post. 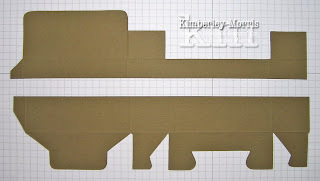 The pattern is set up to print ON THE BACK of a full 8-1/2" x 11" sheet of Designer Series Paper or card stock, to give you 5 sets of layered lids for ease in making multiples. (If you print on two different colored or patterned sheets, you can alternate box lids and layers to get 10 coffin lids with contrasting layers--5 will have one sheet as the coffin lid, and on the other 5 that sheet will make the lid layer.) Or, you can just print out and trace one of each pattern onto card stock or chipboard to use as a template to trace around time and time again. Either way you go, you'll need to cut out a coffin lid, and a coordinating smaller layer (if you want one). 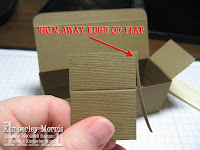 Because the sides of the lid are straight, you can trim them out with a straight edge cutter like the Paper Trimmer, or Tabletop Cutter, to get a very clean look. 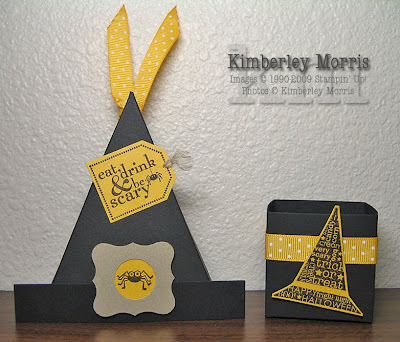 Designer Series Paper (DSP) is great for the smaller layer, and you can use the Stampin' Up! Perfect Details Texturz Plate with your Big Shot on either DSP or regular card stock, and rub some ink over the dry embossed pattern with a Stampin' Sponge, to give a regular piece of card stock some really fun depth! Adhere the coffin lid to the box top, being careful to center the lid over the box. This is most easily done by lying the coffin lid flat on your workspace, FACE DOWN. 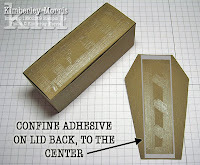 Place adhesive of the back of the coffin lid, only the area where it will adhere to the box lid, as shown below. 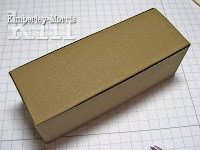 Then, put your adhesive on the top of box lid (you can open up the lid of the box to lie it flat on your workspace if that's easier). Close the box lid, and lower the closed box down onto the adhesive on the back of the coffin lid. ONLY VERY LIGHTLY touch the pieces together, to attach them just enough to hold the pieces in place so you can turn the box over to be sure the coffin lid is where you want it. If not, gently peel back and reposition the lid. When all is positioned well, open the lid of the box and burnish the box lid down onto the coffin lid to adhere permanently. See picture below. I like to adhere the coffin lid to the box top first, before adding any layers onto the top of the coffin lid, because it makes the burnishing so much easier and more effective. Mini Glue Dots and Stampin' Dimensionals are excellent adhesive choices for any layers you want to add to the lid, because they stick well without applying a lot of pressure, or burnishing. 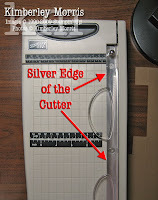 The Modern Label Punch is used to make the handles on the side of the coffin. There are two on each side of the box, so you'll need 4 punched tags total. I like to stamp the tag from the Favorite Things stamp set, and then punch that out with the Modern Label Punch. 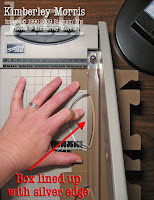 You can adhere your handles with brads if you like that look, but Mini Glue Dots are just the right size for adhering the tags directly to the box. TIMESAVER TIP: If you're making tons of these for a party, especially for children (who may not appreciate the extra effort!) consider leaving the handles off altogether. 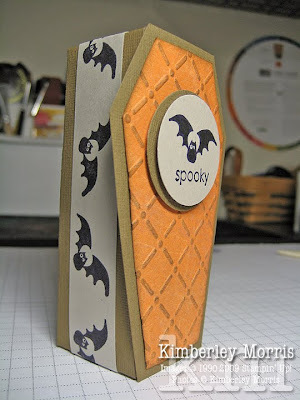 Or, use Designer Series Paper or stamped card stock to wrap around the coffin, as I've done below, using the Halloween Frights stamp set. You can load these with whatever treats you want, but candy corn and pumpkins are pretty cute. You can also fit 8 Hershey® Nuggets in the coffin, as you can see below. Leave the Nuggets plain, or stamp return address labels seasonally to wrap around each individual Nugget. 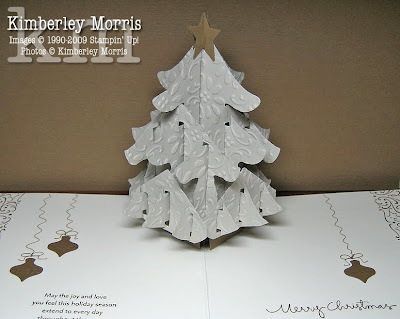 Designer Series Paper is also a simple, festive touch! 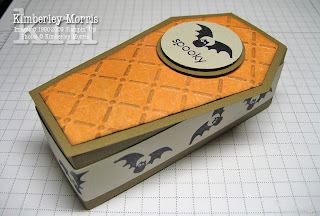 DESIGN NOTES: If you aren't into coffins or Halloween, you can still use the Box #2 Die to make cute treat boxes for other occasions. I'll show you later how you can make these boxes with Christmas Trees or ornaments on top, and you can use them again for Valentine's Day with hearts on top, and even make a bunny for the lid to use the box for Easter. The Box #2 Bigz XL Die is a must-have!!! Order your spooky supplies online anytime with a debit or credit card at my ONLINE STORE! 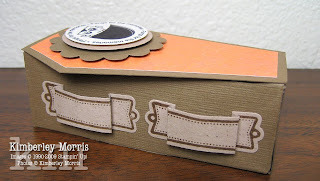 Mention this Coffin Box Tutorial within 24 hours of your online order during the month of October 2009, and receive a FREE Stampin' Write Marker in the color of your choice! Please email me with any questions, or leave a comment and I will answer your question in a comment reply.